Prerequisite: Any university (U) or university/college (M) preparation course in social sciences and humanities, English, or Canadian and world studies. This course enables students to acquire an understanding of the nature of philosophy and philosophical reasoning skills and to develop and apply their knowledge and skills while exploring specialized branches of philosophy (the course will cover at least three of the following branches: metaphysics, ethics, epistemology, philosophy of science, social and political philosophy, aesthetics). Students will develop critical thinking and philosophical reasoning skills as they formulate and evaluate arguments related to a variety of philosophical questions and theories. They will also develop research and inquiry skills related to the study and practice of philosophy. In this first unit of the course, students will spend time looking at what truly makes a good philosopher. They will look at the elements of a definition, the various kinds of definitions that exist as well as the differences between these kinds of definitions. Students will then look at arguments with the aim of understanding their structure as well as the two different kinds of arguments that exist. This unit also takes a look at ways to appraise an argument and, in particular, ways to discover faulty premises within an argument. Students will then go on to look at the meaning of a fallacy and discuss various selected examples of fallacies and learn just why they are mistakes of reason. Finally, students will briefly look at the life of the ancient Greek philosopher, Socrates, the Socratic method as well as examining how the Socratic method might even be more useful to us today than it was thousands of years ago. The Metaphysics unit will begin by describing the ideas of the ancient Greek philosopher, Plato. Students will learn about his famous theory of the Forms and how it paved the way for all subsequent discussion regarding the mental and physical worlds or, more generally, the mind and body. Then the course will look at the ideas of the ancient Greek philosopher, Aristotle. In particular, students will learn about Aristotle's particular conception of what is real in the world and how it corresponds and relates to Plato's theory of the Forms. Third, students will study the medieval Italian philosopher, Saint Thomas Aquinas. By looking at Aquinas' ideas they can see how he takes some of the views of Plato and Aristotle and combines them into a theory which he believes best explains the relationship between the mind (or soul, as he calls it) and body. Fourth, the course introduces the French philosopher, René Descartes, who is known to be the father of modern philosophy. In this section of the unit students will see how Descartes believed that he solved the question of whether to accept the existence of the mind or the body by accepting both as well as the serious problem that results from this position. Fifth, students will then look at the Dutch philosopher, Baruch Spinoza, who is known for his rather unorthodox views of God. In particular, students will see how his views on the mind and body are dramatically different than Descartes' and will learn about the important alternative theory within philosophy that Spinoza is known to defend. Sixth, students will examine Gottfried Wilhelm Leibniz's ideas, the German philosopher known for his rather peculiar theory about what really exists in the world. They will learn about the unique entity that he defends in particular as well as its relation to the mind and body in general. Finally, students will end the unit by studying the views of the Irish philosopher, George Berkeley, another philosopher known for his bold and very abstract views. They will learn about the specific theory that he defends as well as how his views are explicitly different than the other philosophers studied. The main aim of this unit will be to consider the metaphysical question of whether certain entities, such as the mind and body, really exist in the world. By studying each of the seven philosophers, all of whom are widely regarded as the greatest philosophers of all time, students should be able to gain an understanding of both their theories in general as well as how their theories relate to and address this important metaphysical issue. In the Epistemology unit students will take the time to learn about and focus their attention towards several areas of concern in the study of knowledge. For instance, the unit will begin by describing the epistemological theories of the ancient Greek philosopher, Plato. Students will learn about his distinction between belief and knowledge and how it paved the way for all subsequent discussion regarding the mental and physical worlds or, more generally, the mind and body. Then the course looks at the epistemological theories of the ancient Greek philosopher, Aristotle. In particular, students will discover that Aristotle is reluctant to totally reject the role of belief and will learn how this reluctance is ultimately related to his theory of sense perception. Third, they will study the epistemological theories of the medieval Italian philosopher, Saint Thomas Aquinas. By looking at Aquinas's defence of the mental quality known as the phantasm they will learn how this quality plays a prominent role in his theory of how they can attain knowledge. Fourth, students will be introduced to the epistemological theories of the French philosopher, René Descartes. In this section of the unit students will be presented with the famous theory within philosophy that argues that knowledge comes from reason, namely, rationalism. Then they will go on to study the epistemological theories of the English philosopher, John Locke. In particular, students will learn about the famous theory within philosophy that argues that knowledge comes from experience, namely, empiricism and will learn how it differs sharply from the theory of rationalism. Students will then examine the epistemological theories of the Scottish philosopher, David Hume. Here they will learn about the theory of scepticism and how Hume is primarily sceptical of reason and the theory of rationalism. Finally, students will end the unit by studying the views of the German philosopher, Immanuel Kant. In this final section they will learn about the high level of priority that Kant attaches to the role of reason and his consequent theory known as transcendental idealism. The main aim of this unit will be to examine some important epistemological theories as presented by some of the greatest philosophers of all time. By studying each of the above seven philosophers, students should be able to gain an understanding of their philosophy in general as well as how their philosophy relates to and addresses fundamental questions concerning the study of knowledge. In the Ethics unit students will take the time to discuss some of the directions that philosophers can take within moral philosophy. For instance, the unit will begin by discussing the ethical theory of the ancient Greek philosopher, Plato. In particular, they will learn about how his famous theory of the forms is related to the branch of ethics in particular as well as his important conception of the Form of the Good. Then students will look at the ethical theory of the ancient Greek philosopher, Aristotle. Here students will discover that, rather than following Plato's theory of the forms, when it came to living ethically Aristotle was more concerned about choices and actions in life as well as the specific notion of virtue. Next students will study the ethical theory of the third major philosopher to come out of ancient Greece, Epicurus. In particular, students will see how Epicurus' ethical theory is distinct from that of Plato's and Aristotle's and students will pay close attention to the notion of pleasure, the concept at the foundation of all Epicurean philosophy. Fourth, students will be introduced to the ethical theory of the Italian philosopher, Saint Thomas Aquinas. Students will learn how his ethical views are related to the theory within philosophy known as objectivism and, in particular, students will examine the main idea behind natural law theory. Then students will go on to study the ethical theory of the English philosopher, Jeremy Bentham. In this section of the unit students will be presented with the famous theory within ethics known as utilitarianism and will discuss Bentham's founding role with respect the theory. The course will then examine the ethical theory of the American philosopher, John Rawls. Here students will learn about the famous theory within ethics known as contractarianism and students will discuss the ways in which Rawls is understood to be a contractarian philosopher. Finally, students will end the unit by studying the ethical theory of the Canadian philosopher, G. A. Cohen. In this final section students will learn about the famous theory within ethics known as egalitarianism and students will learn about the ways in which Cohen is understood to be an egalitarian philosopher. The main aim of this unit will be to examine some important ethical theories as presented by some of the greatest moral philosophers of all time. By studying each of the above seven philosophers, students should be able to gain an understanding of their philosophy in general as well as how their philosophy relates to and addresses fundamental questions concerning the study of ethics. In the Political Philosophy unit students will take the time to discuss many of the different approaches to political philosophy as defended by some of the most famous and important political philosophers in the history of philosophy. For instance, the unit will begin by discussing the political philosophy of the ancient Greek philosopher, Plato. In particular, students will learn that a central part of Plato's overall political theory was focused on outlining certain conditions that he believed would lead to what he viewed as the ideal state. Then students will look at the political theory of the ancient Greek philosopher, Aristotle. Here students will discover that, rather than following Plato's goal of establishing the perfect state, what mattered more to Aristotle was the establishment of the proper function of the state for he viewed this as being the more important question. Next students will study the political theory of Thomas Hobbes. In particular, students will be introduced to the historical idea of the state of nature and will study exactly what the author of the famous idea had to say about it. As students will see, even today the concept of the state of nature is thought to provide the very reason why students should want government in their lives and why it is necessary and for this reason it is an imperative concept to study in any course in political philosophy. Then, in the next lesson students will go on to discuss the philosopher known as the father of liberalism, a theory which is easily said to be the most dominant political philosophy of the Western world, namely, John Locke. In particular, students will explore his ideas and learn how they are what provide the foundation of this massively influential political theory. Following that, students will discuss the philosopher regarded as the father of the important theory of conservatism, Edmund Burke. Students will learn about some of Burke's main ideas and will see how they would become to be the founding principles within conservative thought. Then, students will discuss the philosopher who is the father of the major political theory known as Marxism, namely, Karl Marx. Students will learn about the basic principles that Marx stood for and will come to understand how all of his ideas eventually became referred to under the general heading of Marxism. Finally, in the last lesson of the unit students will discuss the philosopher considered to be a key representative of the major and increasingly popular political theory known as libertarianism, namely, Robert Nozick. The course will illustrate how his ideas are deeply rooted in libertarian thought as well as how they are related to a particular form of anarchism, the theory that states that society can and should exist without government. The main aim of this unit will be to examine some of the most important political questions and theories as presented by some of the greatest political philosophers of all time. By studying each of the above seven philosophers, students should be able to gain an understanding of their philosophy in general as well as how their philosophy relates to and addresses fundamental issues concerning the study of political philosophy. In this unit students will take the time to discuss many of the themes within existentialism as portrayed by some of the most famous and important existential philosophers. For example, students will begin the unit by studying the philosopher who is considered to be the father of existentialism, Soren Kierkegaard. In particular, students will consider the general belief of his works, namely, his notion of subjectivity, as well as some of his more specific beliefs concerning what he refers to as 'spheres of existence.' Then students will look at some of the existential themes within the philosophy of Friedrich Nietzsche. Here students will be introduced to some key concepts within Nietzsche's philosophy and will try to understand how they might all fit together to form a coherent theory about ourselves. Next students will study the existential ideas found in the works of Martin Heidegger. Students will look at what makes Heidegger an existentialist as well as his ideas concerning his special notion of being which he refers to as 'Dasein.' Then in the next lesson students will go on to discuss the existential ideas of Jean-Paul Sartre. In particular, students will study his concepts of freedom and choice as well as his idea that consciousness is really just nothingness. Following that, students will discuss the work of Simone de Beauvoir and discover what specifically makes her an existentialist. In order to do so, students will learn about her views on ethics as well as her rejection of the traditional notion of femininity. Then students will discuss Maurice Merleau-Ponty and the existential themes found within his philosophy. In particular, students will learn how significant the body is to his philosophy and why he believes it is so crucial to gaining a comprehensive understanding of ourselves and the world. Finally, in the last lesson of the unit students will discuss Albert Camus and the existential themes presented in his works. Here students will see how, more than anything, he devotes his time to understanding the question of how one should be said to exist in an ultimately absurd world. The main aim of this unit will be to examine some of the most important existential ideas and themes as presented by some of the greatest existentialists of all time. By studying each of the above seven philosophers, students should be able to gain an understanding of their philosophy in general as well as how their philosophy relates to and addresses fundamental issues within existentialism. In this final unit of the course students are going to look at how the subject applies to the real world, that is, students are going to talk about philosophy and how it relates to everyday life. After all, philosophy does indeed have real life implications and it is important to know that the subject has both a meaning and relevance that reaches far outside of the philosophy classroom. 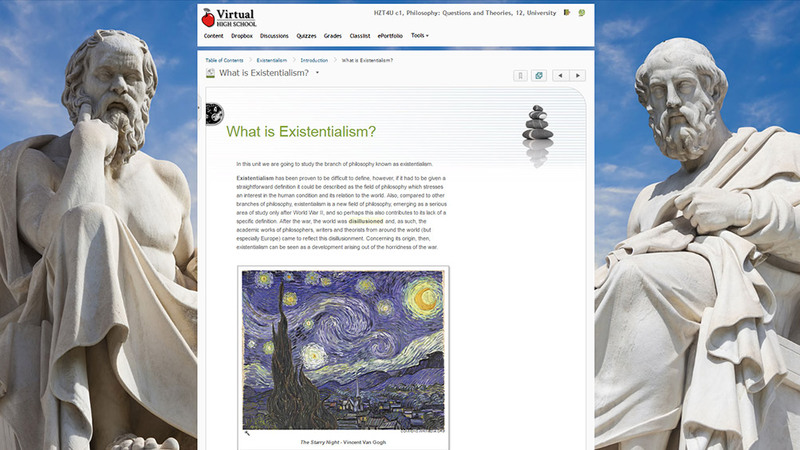 For example, as students might have experienced in some of their other courses, it is quite common for philosophy to be discussed in other subjects as well. In fact, philosophy is not only discussed in other subjects but, quite frequently, it is what provides the very foundation for which many subjects are built upon. Furthermore, it is important to realize that philosophy also exists and is very much alive within the media. One just has to pick up a newspaper to see the philosophical significance of many current issues. There is also very much to be said about those current philosophers who are making a difference in the field of philosophy as students speak. This just proves how great philosophy is not something that was produced generations ago but is, rather, still very much alive and being created today. Also relevant with respect to philosophy and everyday life is the issue of being able to find a job in the field. As a student of philosophy, for instance, it is important to know and understand what kinds of options are available to them were they to decide to seriously pursue the subject. Finally, another consideration to bear in mind when discussing the relationship between philosophy and the real world is the perhaps rather popular notion that philosophy has no relevance to the real world. Even though these particular kinds of comments are ultimately criticisms of philosophy, they, nonetheless, prove how philosophy has an undeniable impact on the world. In this concluding unit, then, students will spend time looking at each of the above concerns. First, students will see how philosophy is associated with other subjects and will discuss the relationships between philosophy and religion, philosophy and science and philosophy and literature and poetry. Then students will look at how philosophy is discussed in the media. Students will look at three articles found online and discuss some of the interesting and relevant points of each article. Next students will take some time to discuss some well-known contemporary philosophers. They will learn about the kinds of influence that they have had on philosophy today and why their thoughts and ideas will likely continue to have an influence in the future. Then students will go on to look at some of the different types of jobs that a person can enter into with a philosophy degree. While the most obvious career path for students of philosophy might be thought to be the continuation of philosophical study at advanced levels, in fact, there exists a wide range of different careers that many philosophy students commonly pursue. Finally, in the last lesson of the course, students will highlight some historical thinkers who have been rather critical of philosophy and will come to see what kind of weight, if any, these thinkers' criticisms might have. The future of philosophy will also be discussed and the course will end on a positive and optimistic note defending the vast usefulness of this very important subject. This concluding unit should help to shed light on some of philosophy's more practical aspects as well as its exact role within the real world and everyday life. It might be popular to think that philosophy has no practical relevance to real life, however, it will be the main aim of this unit to dispel this notion and to emphasize that philosophy has just as much relevance as any other subject that students may study in school. This project is worth 30% of the final grade. For the course's culminating activity students will have the opportunity to consider and respond to a passage from a primary source either in book format or from an online source. B2 Philosophical Reasoning: demonstrate an understanding of philosophical reasoning and critical thinking skills, including skills required to identify and avoid common fallacies of reasoning, and demonstrate the ability to apply these skills in various contexts. C4 Philosophical Reasoning in Metaphysics: use philosophical reasoning skills to develop, communicate, and defend their own responses to metaphysical questions. D4 Philosophical Reasoning in Ethics: use philosophical reasoning skills to develop, communicate, and defend their own responses to philosophical questions in ethics. E4 Philosophical Reasoning in Epistemology: use philosophical reasoning skills to develop, communicate, and defend their own responses to epistemological questions. F4 Philosophical Reasoning in the Philosophy of Science: use philosophical reasoning skills to develop, communicate, and defend their own responses to questions in the philosophy of science. G4 Philosophical Reasoning in Social and Political Philosophy: use philosophical reasoning skills to develop, communicate, and defend their own responses to questions in social and political philosophy. G4 Philosophical Reasoning in Aesthetics: use philosophical reasoning skills to develop, communicate, and defend their own responses to questions in aesthetics.